While most of the Star Wars conversation for the last two years has been about the resurrection of classic filming techniques, practical effects, and the characters new and old that are helping to expand the Star Wars universe, there's an undeniable other trend: finally, there are true female lead characters in the Star Wars universe. 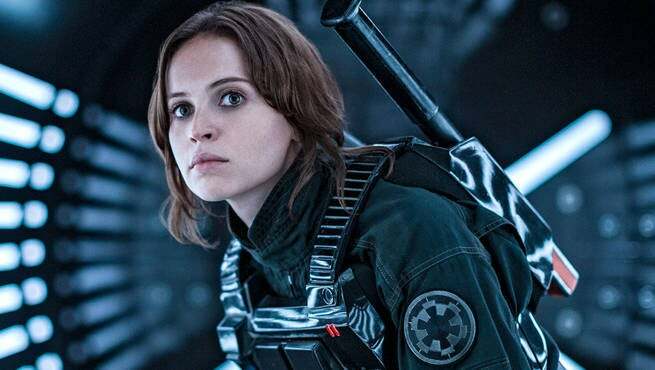 Jyn Erso is the newest character in that vein, portrayed by Felicity Jones in Rogue One: A Star Wars Story. In The Art of Rogue One: A Star Wars Story, a new book availabe now from Abrams Books, Jyn's character is described as "hardened and alone, flawed and adrift," terms that may sound like they're focusing on her flaws. That's on purpose, as the point that she's a flawed human being is central to her character - as is her being a woman in the first place. "What I love so much about Jyn Erso is that she's an imperfect female warrior - authentic and genuine, truthful and humble, strong and modern without feeling contemporary," producer Allison Shearmur says in the book. "Oftentimes, Hollywood wants to see a strong woman apologize for not appreciating her life, or dedicate herself to figuring out why she's a certain way. What I love about Jyn is that hers isn't a story of wishing she'd made other life choices. This isn't an apology." That idea of Jyn being able to simply live and be complex without having to account for it is one that Shearmur says other characters in particular have embodied. "She's equal parts Joan of Arc and Sigourney Weaver's Ripley [from the Alien series] - a pure hero, independent of gender. Someone who sets out to do something impossible, and does it," the producer says. Art Director Doug Chiang said she also builds upon their own history of strong female leads. "Star Wars has always appealed to women. There have always been strong women, starting with Princess Leia, but the fact that Jyn is now the lead in the story, that it's so completely about her, just expands the Star Wars universe that much further. Setting everything around her is so brilliant and so exciting, and lets us come at things from a female point of view." The next Star Wars film is Star Wars: Episode VIII, coming next December. That movie will continue the streak, once again starring Daisy Ridley as Rey, though it's arguably more of an ensemble cast even than Rogue One was. After that is Han Solo, another Star Wars Story film, which has Emilia Clarke cast in an as-yet-unnamed female lead role.